Two nights ago I had a dream where I took the time to prepare a proper painting space. I even had a "consultant" come in (cue @MonkeySloth) who told me what pieces of furniture to buy and how to arrange them. (I later told him about it and he sent me a picture of his own active workspace-- I'm not alone in my creative mess!) Yesterday I started to re-evaluate my painting set-up and wondered if I could make it better. Lately, I've been gravitating toward a table surrounded by windows since I prefer to paint in natural light. While I often paint at night after work under a lamp, I enjoy painting on the weekends for long periods of time in the middle of the day. I've also accumulated enough mini stuff and loose paints where I've taken over the dining table. Now, it's not much of a table-- it's an unfinished pine 3x4' IKEA desk I bought for $70 four years ago that matches the previous Chair of Shame. Still, I shouldn't make a habit of spending every meal sitting on the floor at the coffee table. In another room I have this this cute shelf/desk combo (see below) which was a gift from my MIL-- a four-drawer unit with wings that prop up on either sides and I can park my chair under one side or the other. However, I've found that my immediate painting set-up has outgrown the side panel. I think I need to move it away from the only tiny window in the room and consider some wall shelving. 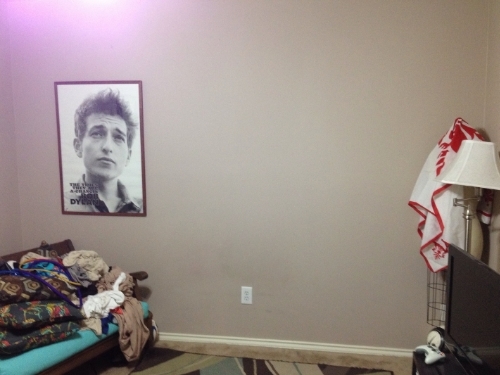 Now just think, with the proper lighting, a good portion of this wall could be dedicated to painting & storage. There's only one problem: I can't have my back to the door. It sounds ridiculous, but I just can't compromise when it comes to having my back to the door. I absolutely can't stand it. It gives me the creeps and I'm always glancing over my shoulder at every little noise. I'm an easily startled person and there's nothing more detrimental to my in-the-zone focus than having the dog suddenly bump into my chair-- I scream bloody murder and my mini goes flying through the air in slow motion. (Trust me, it's happened. Twice.) So really, it's less of a quirky preference and more of a conscious decision to spare the sanity of myself and everyone else on the block. This weekend I plan on wandering around my local home improvement store and doing my research on cost-effective ways to improve my current set-up. I'll share my findings with you on Monday!